My hair is typically flat and dull, with very little body, as you can see. I have extremely dry hair because I am so hard on it (hair colouring, straighteners, curling irons, hair dryers, etc). So when I received the Fibralogy products, I was excited to give it a try. Fibralogy products are meant to thicken your hair and provide you with more body. Sounds good, right? First, you begin with the Shampoo, once it's rinsed from your hair, you add a small amount of the thickening booster and, without rinsing the booster, add the conditioner, then it gets rinsed out together. Ultimately, the products are meant to leave your hair feeling clean, thicker and softer. I've been using these products for a week now, I'm not sure that my hair feels much thicker, however, I do notice my hair is softer and certainly appears to have a little more body to it. 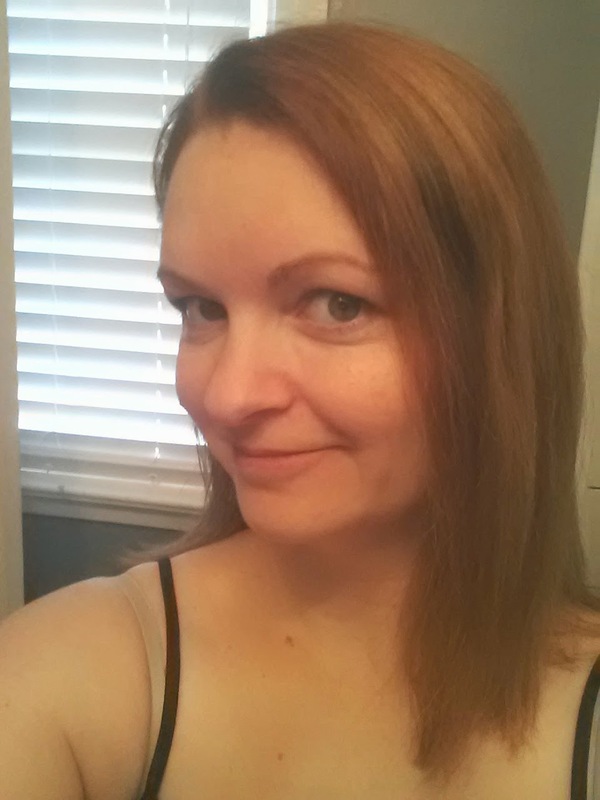 Here is my "after" picture. What I love about these products is that a little goes a long way. You only need a small amount of product for it to do it's work. I also love that my hair doesn't feel greasy or weighed down after I use the products, as some products have done in my past. They also don't have an overwhelming smell, which is great, because I have had some shampoos that are so scented that I can't wear them to my scent-free workplace. So what does this all mean? I think these are good products. I'm not sure that I would purchase them to thicken my hair, but I love the way my hair feels when I use them. I've scouted these products out at some of my local stores and the prices are very comparable to other similar brands, so you're not breaking the bank for great quality. I would recommend these products if you're looking for softer hair with a little more body, but the jury's still out on the "thickening" claim. I plan to continue to use these products to see if I notice a difference. I will share once I'm done the bottles! Have you tried the Fibralogy products? What did you think?